On the idyllic campus of Indiana University, Little-Libby-Nobody runs into Band-Aid All-American-Athlete, and fireworks explode. Libby and Aidan spiral into a collision course of love at first sight versus lust you can’t fight. As the game plays out and their affection grows, they soon realize that labels like cutters and jocks can’t keep them apart. 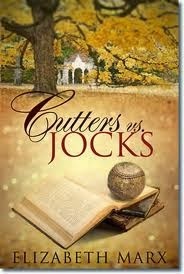 Review: Cutters vs. Jocks is the prequel to Binding Arbitration where a single mom has to track down the father of her child who needs a bone marrow transplant. I was expecting a great love story between college students who find themselves in a tough situation and tearfully part ways. What I read was a relationship that can be described at best as flirting. They were not really friends, never had in depth conversations, never talked about themselves (truthfully) or their families. This flirting goes on for over a YEAR before Libby decides to sleep with Aidan when she doesn't get into Harvard Law (not that Aidan even knew she was applying to law school because heaven forbid they actually communicate). Next thing you know, she's pregnant and they both handle it with the maturity you'd expect-which is not that well. I didn't hate this, but since Binding Arbitration has such a heavy promise (kid dying of cancer) I was hoping this novella would have meat to it. I didn't read this book as two people who are madly in love with each other and didn't know how to handle it nor the pregnancy. The flirting was funny at times and it was cute.